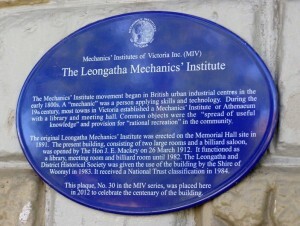 Leongatha’s history is preserved and promoted by the Leongatha and District Historical Society through the museum in the Leongatha Mechanics’ Institute, in McCartin Street. The museum is open Thursday and Friday afternoons, between noon and 4pm. 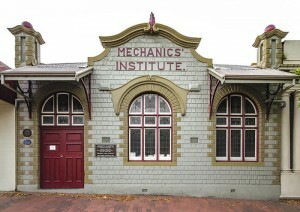 The Leongatha Mechanics’ Institute was first opened on March 9th 1891. In June 1890 there was a meeting in Hayes Store, in Roughead St, to discuss the formation of a Mechanics’ Institute. A committee was formed and funds sought for the building which was to be erected on crown land. The building cost £475 and money was raised by having functions such as a “Bazaar and Fancy Fair”. Many local organisations such as church groups, the Shire of Woorayl and the Crown Lands Department used the building when meeting and office facilities in the town were limited. By 1910 the Mechanics’ Institute Committee felt confident in the town and plans were drawn up for a new Mechanics’ Institute. Fully aware of the risk of fire in the town where most structures were made of wood, the committee instructed the architects to draw up plans for a concrete building comprising a library, members room and a billiard room to hold two full size billiard tables. It was also decided to have metal ceilings. The external walls were made of concrete bricks and the interior walls of plaster of paris reinforced with river reeds. This unusual method of onstruction does not seem to have been used anywhere else in Victoria. 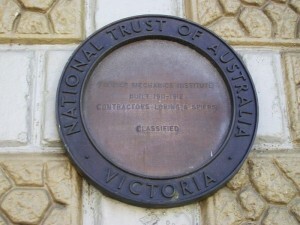 The building was officially opened by local member J.E. Mackey MLA on March 26th, 1912. The original wooden building was destroyed by fire and the Memorial Hall was built on the site in 192526. We thank those early planners for the beautiful building we now have as the home of the historical society.